Garrison Releases 4th Annual "3 Fields Harvest Ale"
Despite a somewhat rainy growing season, Garrison Brewing coordinated the largest harvest of fresh Nova Scotia hops yet from growers in Ashdale, New Ross and Glenholme plus New Brunswick barley malt to craft a truly Maritime harvest beer! 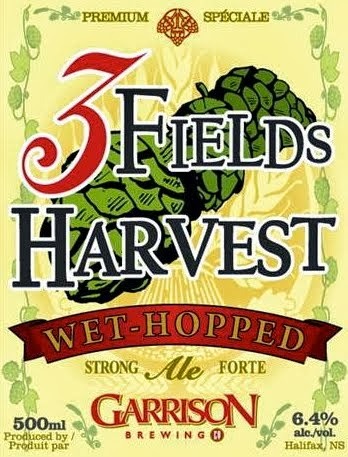 Launched September 2010, 3 Fields Harvest Ale highlights the increasing availability of local brewing ingredients in this once-a-year brew. It demonstrates the viability of locally-grown raw materials while celebrating their unique characteristics. "We're basically showing off how great a beer can be when fresh, local hops are taken from vine to kettle in the same day," said Garrison president Brian Titus. "Almost 200kg of wet (green) hops were harvested and hand-picked at four separate Nova Scotian farms then added directly to the boil. Wet hops impart a more subtle hop fragrance and bitterness, making them a pleasure to brew with. Lemon, orange, grapefruit, pine and ginger notes are all present to some degree in this truly special harvest brew," added Titus. 100% of the hops were grown in Nova Scotia at the following fields: Meander River Farm and Wentworth Creek (Ashdale), Fiddlehead Hop Farm (Glenholme) & Ross Farm Museum (New Ross). The complex flavours showcased in 3 Fields can be attributed to the wide variety of hops in the beer including Nugget, Newport, Galena, Cascade, Zeus, Centennial and Brewers Gold.